DETAILS FOR Eric Hutchinson to perform at the Nittany Block Party! 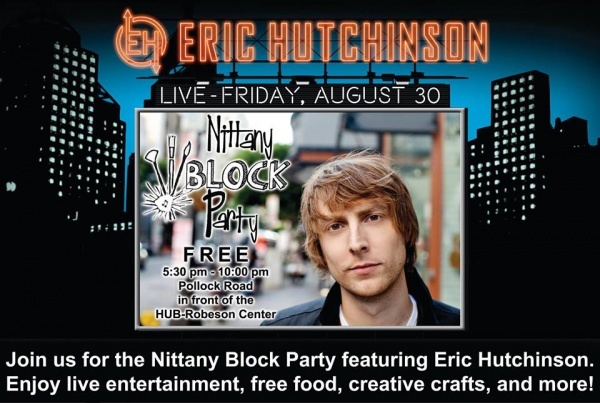 Eric Hutchinson to perform at the Nittany Block Party! Comments Off on Eric Hutchinson to perform at the Nittany Block Party! The third annual Nittany Block Party will begin at 5:30 p.m. on Friday, August 30 on Pollock Road in front of the HUB-Robeson Center. The event is free and open to the public. Pop recording artist Eric Hutchinson will headline the event. The event will also feature performances by student groups, food and activities from multiple organizations. This event is sponsored by Union and Student Activities, New Student Programs and the Student Programming Association.